If You Are Looking to Get Rid of Unwanted Stubborn Flanks, Then CoolSculpting Could Be Solution for You! Contact Ariba Medical Spa Today for More Information. We are Conveniently Located Near You at 37553 Fremont Blvd, Fremont, CA 94536. You can now get the body you’ve always wanted in Fremont, California without having to go under the knife. The team at Ariba Medical Spa, under the direction of aesthetic expert Tariq Mirza, MD, conveniently offers body sculpting treatments with CoolSculpting®. This state-of-the-art system targets and flushes the fat around your problem areas with lasting results. Get started on the path to a new you by scheduling a CoolSculpting evaluation online or over the phone. CoolSculpting uses innovative cryolipolysis technology to freeze fat away. During each treatment, your aesthetic specialist applies the system’s paddles to your targeted area. The system sends waves of cool energy through your epidermis, into the underlying fat cells. This freezing process disrupts the natural structure of fat cells, forcing them to break down. Your lymphatic system immediately jumps in and starts getting rid of the fat particles, pushing them out through waste. Over the following weeks, your treated area becomes firmer and tighter as those fat cells get flushed away. Yes! As an FDA-cleared treatment, CoolSculpting treats fat cells safely and effectively. Once targeted fat cells are gone, they’re gone for good. Because it’s certainly possible to gain weight in the future, if you don’t follow a healthy diet and exercise plan, you can develop new fatty deposits. To ensure your CoolSculpting results last a lifetime, continue watching what you eat and exercising most days of the week. Do I need more than one CoolSculpting session? It depends. While most men and women notice an improvement in their treatment area within 2-3 weeks, it can take up to 4-6 months for you to achieve optimal results. Usually, you can reach your desired outcome in a single treatment, but if you have deep fatty tissues, you might need a follow-up session. It’s also common to fall so deeply in love with the initial results that clients want to come back for another treatment session. For instance, if you’ve had CoolSculpting to smooth out your abdominal area, you might also want to treat your flanks and further tone your midsection. Dr. Mirza can help you design an ideal CoolSculpting treatment plan that’s tailored to your goals. What is the recovery like after CoolSculpting? There is no downtime after CoolSculpting, so you can even schedule sessions during your lunch break. Plus, if you want to target multiple areas at once, the team at Ariba Medical Spa can help by offering dual CoolSculpting with multiple paddles. You can have several areas treated and be in and out of the clinic, all within an hour’s time. 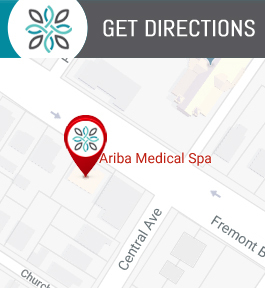 Schedule your CoolSculpting consultation at Ariba Medical Spa by using the online scheduling system, or by calling the clinic.